Over the past five years, I have had the privilege of being a speaker at a number of conferences dedicated to Bible prophecy. Prophecy enthusiasts (“buffs”) come to such conferences—and do so with frequency. I have had the chance to meet many people who stop by my table to buy a book or just chat. Consequently, I see many of the same faces from one conference to the next. During this time, I developed some terrific friendships with many of these frequent attendees. For me, “reconnecting” remains one of the best aspects of doing these conferences. Despite the gap of six or twelve months between meetings, familiar faces light up when eyes meet. The friendship almost instantly rekindles. Reconnecting brings genuine spontaneous joy. It may or may not be the primary reason we anticipate going to prophecy conferences; however, upon reflection we realize it comprises a major part of the experience that draws us to such events. Yes, we are eager to hear great messages and make new discoveries. Some want to shake hands with an admired author or scholar. And yet, meeting new friends and seeing old ones provides the most long-lasting and meaningful reason for being there. Surely the lack of frequent fellowship with other like-minded believers lies behind this lament. Those who go to a prophecy conference are a quiet and tiny minority. In contrast, attendees at a sporting event number in the tens of thousands and are highly vocal. They even paint their faces, wear stupid clothes, and act like idiots. But the audience of any given prophecy conference is unlikely to reach 1,000. Enthusiasm is generally muted, but underneath the outward demeanor there lies great hope and sometimes exhilaration. That inner excitement stems from being with others that care about the very same things that matter to us. I must admit that I when it comes to “going to church,” I have been a slacker. Since moving back to Oklahoma over a year ago, I have not joined a “local assembly.” There are some great churches here and I need to join one soon. But one thing that holds me back: the nagging fear that what I teach and believe isn’t likely to be embraced by those who lead such an assembly. I worry that I won’t be accepted because I am too emphatic about the coming apocalypse. Indeed, there is something going on with me and many others who believe like I do. It has to do with what I wrote about in my last book Blood Moon: Biblical Signs of the Coming Apocalypse. What is that issue? It’s this: believers in Bible prophecy feel strongly that eschatology constitutes a crucial aspect of the gospel. If fellow Christians in our church or neighborhood fail to recognize that these days are the last days before Jesus Christ comes, we grow frustrated and feel (to use that philosophical word made famous by Karl Marx) “alienated.” We want to experience real kinship based upon deeply shared beliefs. Sociologists may dismiss this motivation and condemn us for seeking merely to overcome “cognitive dissonance”—which is an academic way of asserting that we need one another to reinforce our faith when events unfold unfavorably, challenging what we believe. All of us seek to be with people that share common experiences and beliefs. We are uncomfortable to be without the company of other believers that think like we do. Another more positive way to say it: we seek the comfort that comes from engaging with friends that affirm a shared faith and outlook. We refresh our hope and reinforce our confidence when we gather together. We have a deeply ingrained need to be among those that profess our perspective about the meaning of life. We need to gain consensus on how to interpret the crazy events of this world. We want to affirm that God remains vigilant over each of our lives and remains at work achieving His purposes amidst the otherwise unfathomable circumstances in which we frequently find ourselves. However, it is the supernatural connection we share which undergirds our communion. The Spirit of Christ dwells in us and rejoices when we are together. For while we commune with one another we also commune with the Son of God and the Father. John relates this dramatically and personally: “That which we have seen and heard declare we unto you, that ye also may have fellowship (koinōnia) with us: and truly our fellowship (koinōnia) is with the Father, and with his Son Jesus Christ.” (1 John 1:3) Community begins empirically but extends into the heavenlies. Eschatology advocates require this fellowship more than most. Why is this so? Because our beliefs run so counter to the mentality of this world. I wager very few readers enjoy the frequent company of those who regard what is happening in the world as evidence that the “the last days” are upon us. The standard point of view, aka conventional thinking, remains as follows: “Times are tough, but we’ll get through it… we always have before… today is no different.” However, if you believe as do I that the state of our world surpasses anything that has come before now, that the current course of events will not work out so well for society or the human race in general (that this evil age is in fact coming to a conclusion), your friends probably regard you as a kook. Your family may ostracize you. You work buddies won’t want to hear anything about why the apocalypse is at hand. Sure, they may just “poke fun” at what you believe—but whether subtle or outspoken their disdain usually becomes apparent: they judge you the odd man out. And this sentiment can grow much worse. In fact, you might even come to feel personally threatened if you bring up the subject or offer your opinion with apparent conviction. For example, I have an email “pen pal” in Boston that was fired from a noted university for talking about his belief that Jesus was coming soon. He shared his faith with many co-workers. He led a Bible study. The administration told him to stop talking about Jesus and the end of the world. He refused. After this went on a few months, he was finally fired. Surprisingly, he sued the school and after months of deliberations he ultimately won his case. He was awarded with back pay and damages for having being dismissed without cause. I must admit, I was stunned. I thought he didn’t have a prayer (although many were praying for him!) After all, he was “fighting city hall” (or more specifically, a revered university). Happily this brother stuck by his guns and won his case. I’m happy to report he continues to this day sharing his beliefs and shining as a beacon for Christ. To be sure, his story stands out as one of only a few victories in the work place where Christian beliefs weren’t trampled. Nonetheless, it encourages me. If you believe in Bible prophecy, you need ongoing support. For most, coming to a prophecy conference once or twice a year simply isn’t enough. If you are one of the fortunate few that attend a great fellowship where the minister preaches eschatology, then your need for this sort of camaraderie is likely being met. Good for you—really. However, I suppose that less than one in ten persons who attend a prophecy conference enjoys such a pleasant and affirming situation. If you are one of the nine who don’t, what should you do to galvanize your conviction and benefit from the joy of joining others who profess a similar apocalyptic belief system? Up to now, there hasn’t been a particularly good solution. Consequently, I decided that something had to be done. I joined with four other staunch believers in the soon return of Jesus Christ to launch a new ministry. Like me, they preach, teach, and exhort others on matters of Bible prophecy. Together, we have created a ministry we call simply, The Prophecy Forum (www.theprophecyforum.com). We announced this new entity on August 25, 2014. I encourage you to go to our site and read the announcement. Also watch a 45-minute video where we introduce our ideas about what this ministry should provide and why our team has the means to pull it off. There are a number of reasons why we came together to form this ministry. One of the most important was recognizing that we should do more than just set up and speak at another prophecy conference and sell our books or DVDs. Instead, we must find ways to create community for like-minded brethren. 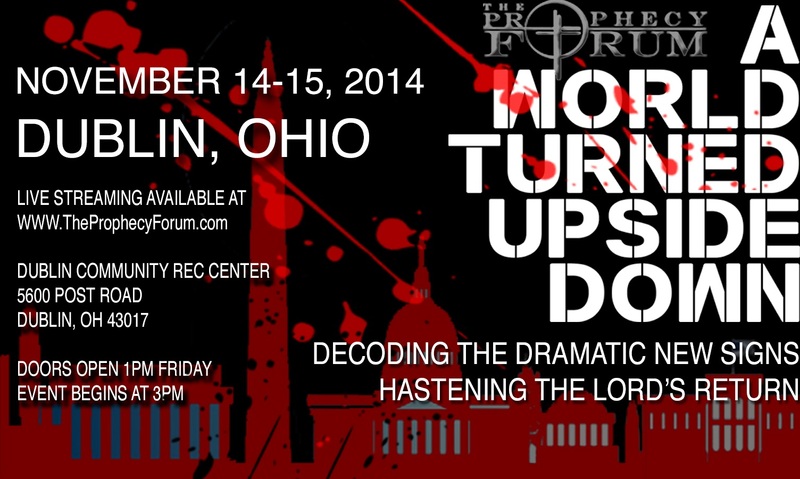 We must develop the resources providing continuity and consistency for those that participate in The Prophecy Forum. One of those strategies involves utilizing social networking to enable such community. Since social networking reaches out globally and connects almost instantaneously to anyone “attached” or “online,” we will build what amounts to a global network of believers that anyone, anywhere in the world can join or participate at whatever level suits their need. Certainly, we are hardly alone exploiting these technologies. There are many doing the same thing, some on a grander scale and perhaps for other good reasons. However, our rationale consists of the following: we hope to grow a community that regularly attends our forums in person or via live streaming (we plan on having about four to five events scattered across the USA every 12 months). Additionally, we will create a forum for conversations among those who are part of the community (using Facebook or Google Circles) to keep our “members” connected. Most importantly, we will supply resources to enable so-called house churches composed of as few as 4 believers and as many as 40 participants who gather in person anywhere in the world. Exactly how each group structures their worship or engages in a Bible Study remains entirely up to them. Our offering will be to supply teaching and connection to form a “movement” of sorts—one based upon a biblical mandate to preach the coming of the Kingdom of God, that proclaims Babylon is falling, that the Church of Jesus Christ must witness against the world system which opposes the God of the Bible, that individuals must repent and believe in the name of the Lord. Old fashioned ideas like sacrificial atonement, the deity of Jesus Christ, the infallibility of the Bible as our only guide for faith and practice, and finally the priesthood of all believers—these great doctrines of Christianity should be upheld and once again serve as the foundation for the Church especially in these last days. For the past 15 years or longer, the most famous Megachurches have been taking their members in the wrong direction: seeking personal prosperity, acquiring happiness as top priority, achieving worldly success by flourishing within the “system,” and aiming to impact society by being “attractive agents” for Christ. This trend may not be reversed before the Lord returns—but it must be challenged. 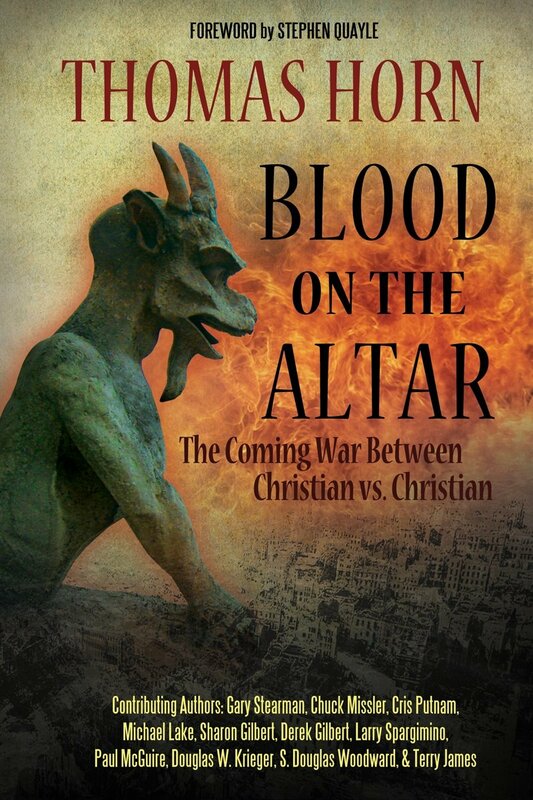 Chuck Missler, in his recent essay published in Tom Horn’s Blood on the Altar: The Coming War between Christian versus Christian, speaks precisely to this point. Missler sees that traditional churches are not structured to take on the status quo. They get “wrapped around the axle” because financial stability is their top priority and they deem their not-for-profit (501c3) status mandatory if they are to stay viable and keep their doors open. Pastors get caught up in church growth to expand their financial well-being, not necessarily to build stronger disciples. Along with Missler, we look at the conventional church model and believe it now amounts to a muzzle order. To retain 501c3 status, Churches must avoid being “political” and stay in their religious sphere of operation. They cannot side with one political party against another. They must be very cautious to not attack the President or his Cabinet members. They must watch their steps very carefully so they don’t run afoul of the current administration. If they transgress, the IRS might just swoop in and cancel the offending entity’s 501c3 status. So much for free speech. “You’ve said too much. We must keep you from disrupting peace and tranquility in our society.” So the government pulls the trigger. Bang! You’re dead! Along with my friend Doug Krieger (a co-author of The Final Babylon and fellow leader in The Prophecy Forum) we also provided an essay for Tom’s book. In our chapter, “When Antichrist Appears in America, Will We Recognize Him?” we discuss how the threat of losing not-for-profit status amounts to the same approach Adolf Hitler used in Germany to silence opposition from either the Evangelical (Lutheran) Church and the Roman Catholics. By splitting the spheres of religion and politics, Hitler co-opted the most likely source to challenge his racial agenda, oppose the Third Reich’s destruction of liberty, and keep blatant Teutonic paganism from gaining control of the country. As the U.S. Federal Government grows increasingly hostile to Christians, we see the same co-option happening in America. Christians are often deprived of free speech and rights of assembly in public places like schools. Christian holidays are no longer respected. Incredibly, even in my “Bible Belt” hometown, Oklahoma City, we are allowing a Black Mass at our Civic Center Music Hall in September, 2014, where I used to go to watch circuses and concerts. What has happened in our society that we would allow this satanic ritual in the heart of our cities but stop the exercise of religious observances in government buildings? The evidence mounts up: appointed political leaders in the Executive Branch and the Courts grow ever more emboldened in their efforts to protect secular humanism and heathen cults while Judeo-Christian principles are downplayed or overturned (despite the fact that such principles lay behind the creation of our revered form of government). Getting back to Missler: Chuck recommends Christians form house churches, mirroring the informal structure of the early Church. In this format, leaders of the assembly have “day jobs” while pastoring becomes their “after hours” vocation. They don’t draw the majority of their pay from the community they serve. By reducing the challenge to finance their church leadership, members eliminate the leverage that Federal or State governments have over their assembly. Collectively, the Church can then take stands against government policies or programs that it deems to be opposed to God’s law or in conflict with biblical principles. For too long the church has operated under the dictum, “If you can’t beat’em, join’em!” We have adopted the ways of the world. There remains no visible distinction. Christianity and the Church no longer provide an alternative way of living that meets the demands of the Gospel of Jesus Christ. To conclude, may we come to recognize that we are not alone, that we can band together across regions, states, or even nations to be members of a truly substantial group—one that has cohesion across all boundaries. No matter how widely separated we may be physically—spiritually, through Jesus Christ, we compose one body and one fellowship. On the local level, even in a small house less than one dozen strong, we must get comfortable with the fact we compose a legitimate part of the Body of Christ. FOR THE CHURCH IN BABYLON.